Have you seen our Sunteca Product Brochures? 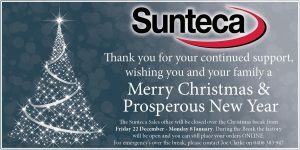 The Sunteca Team wishes you a very Happy New Year and we sincerely trust 2018 is a great year for you, your staff and your families. Many of you have hit the ground running after the break which has resulted in excellent orders for which we thank you very much. Others have used the period to catch up on their holidays and are only now gearing up for what is the hottest three months of the year. We are striving to ensure we can back you up wherever we can and we are mindful that we are only as good as our last order so it is an ongoing hands on process. We therefore look for your constructive comments and feedback whenever it is offered. Friday 22/12/2017 to Monday 8/1/2018. During the break the factory will be open and you can still place your orders ONLINE. Sunteca QVS – Quality, Value and Service. As of Wednesday 23/8/17 we will be reducing prices by placing the following colours from the Sunshadow Fabric range into Group One. 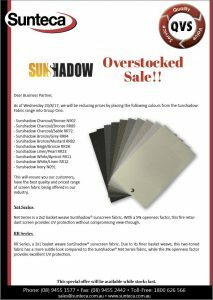 – Sunshadow Ivory N091This will ensure you our customers, have the best quality and priced range of screen fabric being offered in our industry. 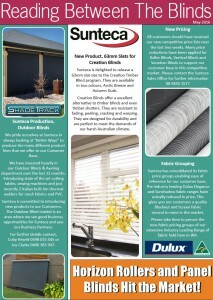 Horizon Roller and Panel Blinds Hit the Market! No Pre-Christmas Cut Off! If you can install it before Christmas then we will supply it. 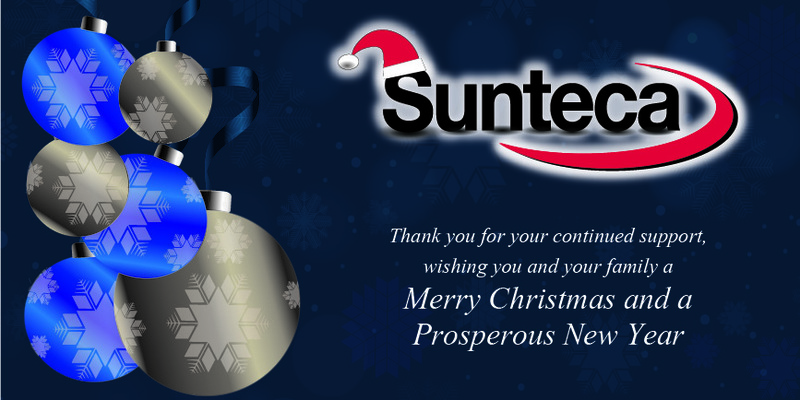 With our streamlined production methods and improved on-line ordering system Sunteca, as always, will not have a, “cut off date,” before Christmas as many other suppliers do. If you can install it, then we will be able to make it! After customer feedback and market demand we have introduced the Fabric Wrap-Around bottom rail in white. Stock is now available and orders can be called up using the bottom rail with our Online Ordering system. 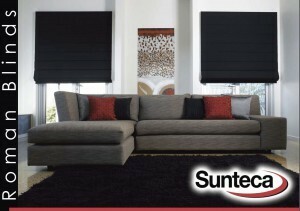 By popular demand Sunteca has introduced the Mantra & Le Reve fabric ranges. 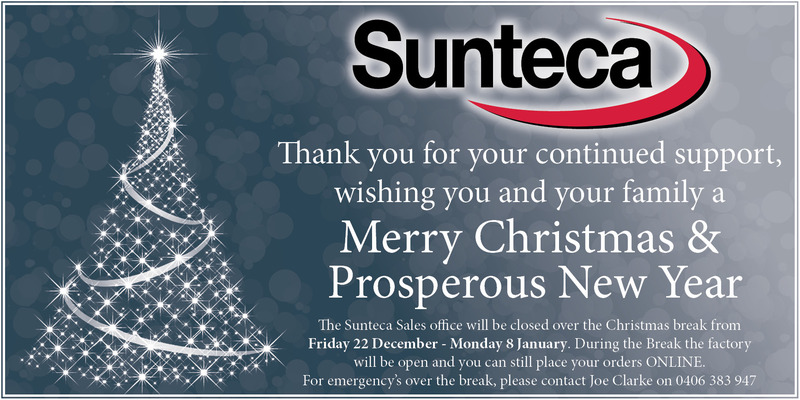 Sunteca are phasing out the ScreenTec range. Timber Shutters to be discontinued! 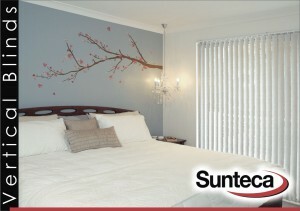 Due to popular demand Sunteca is now supplying Shaw’s Le Reve and Mantra fabrics for custom made Roller Blinds! Light Filtering will be priced in Group 2, Blockouts in Group 3. Dear Sunteca Business Partner,Please join us in welcoming Coby Hewitt as our newest team member. Coby has taken on the role of Business Development Manager as of September 2015. He will be overseeing the Business Development of our customers and has more than 20 years’ experience within our industry.Welcome to the team Coby, trust you will enjoy many years working with us here at Sunteca. 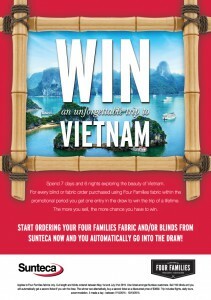 Win a Seven Day Holiday to Vietnam! 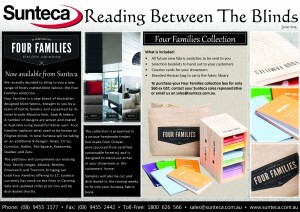 We are pleased to announce an incentive for you to promote the wonderful Four Families range of fabrics. Simply sell a blind using the Four Family fabric and you automatically go into the draw to win a 7 day holiday in Vietnam. Plus, the more blinds you sell or the more fabrics you buy the more chances you have of winning. 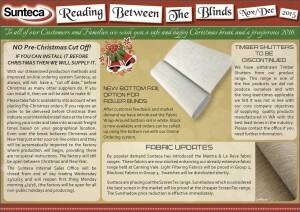 You get one entry for every blind or fabric order. Competition starts as of today! So make sure to get your orders in before July 31st. * New Products Coming Soon! Safety Standard 2014-Commencement 1 January 2015. 1. 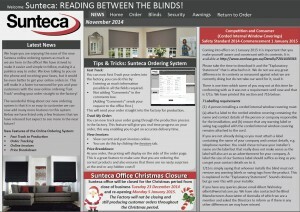 Tips & Tricks: Sunteca Ordering System. 2. 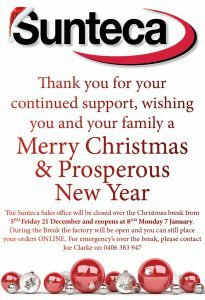 Sunteca Office Christmas Closure. 3. Competition and Consumer (Corded Internal Window Coverings) Safety Standard 2014 – Commencement 1 January 2015. We are very excited to announce that we have upgraded our Sunteca Ordering System as of Monday 1st September 2014… There are many new and exciting features and benefits on our new ordering system such as; easier to navigate, faster system times, also an “Order Tracker” and many more. With this release you will be required to update your details before placing your first order, there after it will just be a normal login to place your order no need to update your information again. If we could please ask to make sure you update your information regularly so that we have the most recent contact information for you. By updating your information it will allow you access to the “Order Tracking” function which will give you access to check the progress of your order in the factory, also it will ensure that you receive the latest Sunteca news updates and product information and pricing. At Sunteca we’ve been investing heavily in our Roller Blind Department with the goal to reduce costs and improve efficiency and output. We’ve purchased new machinery and technology, enhanced our manufacturing methods and adjusted the factory layout to secure significant gains in our manufacturing times. From a stocking perspective we’ve committed to bulk purchases of all fast moving fabric ranges. For many of the slower moving ranges we’ve moved away from the, ‘cut length’ model, to buying by the full roll. The resulting efficiencies have given us good reason to re-cost our roller blinds and the savings achieved are being passed directly onto our customer base in the form of new roller blind price lists. The new prices will be effective as of Thursday 3rd July, 2014. The vast majority of our fabric offerings will see a reduction in price ranging from 5% to 30%, with bigger blind sizes receiving a bigger percentage reduction in price. If you have any questions with regards to the prices please don’t hesitate to contact the office. Once again we have highlighted the absolute necessity to install cord restraints as per the legislation on all internal and external blinds. You have previously been sent copies but if you require another, please contact the Sunteca office. Please ensure your installers are fully aware as to what is required. It is not optional, it is mandatory. 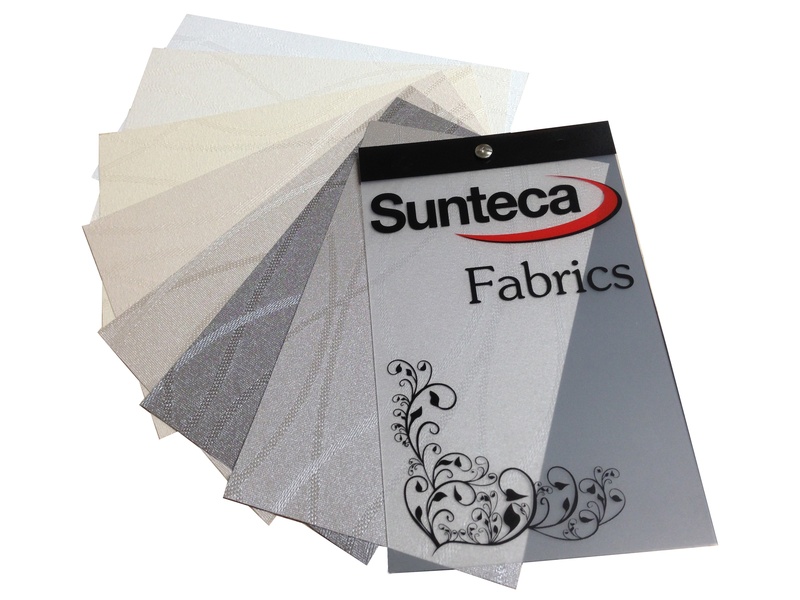 New Sunteca Fabric Range Available! Our newest addition to the Sunteca fabric is the Cascade Range. This fabric is Australian Made and has a shimmer to it, also quite a soft handle for dual sided patterned fabric. The Cascade Range is available for Roller Blinds up to 2420mm wide and Vertical Blinds 89mm and 127mm. Welcome to 2014 and we trust the beginning of the New Year has been successful for all of you. It’s hard to believe that one month has already passed us… We take this opportunity to introduce our newest member of the Sunteca team, Eddie Robless, who has joined us in our internal sales department. One of Sunteca’s strengths is the culture to promote staff within the company, we were delighted that Eddie has decided to take on new opportunities and challenges after working in our factory previously for about a year. The opportunity of ‘promotion from within” is often overlooked by many companies when looking for new staff, this has been encouraged by our company for many years with great success. 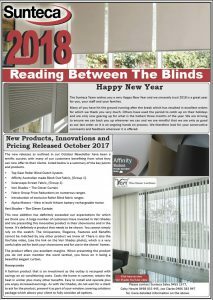 Welcome to the first edition of our newsletter “Reading Between The Blinds”. Communication is a very important pillar in today’s business environment and we look forward to keeping you our customers informed of the latest trends, products and developments within Sunteca. 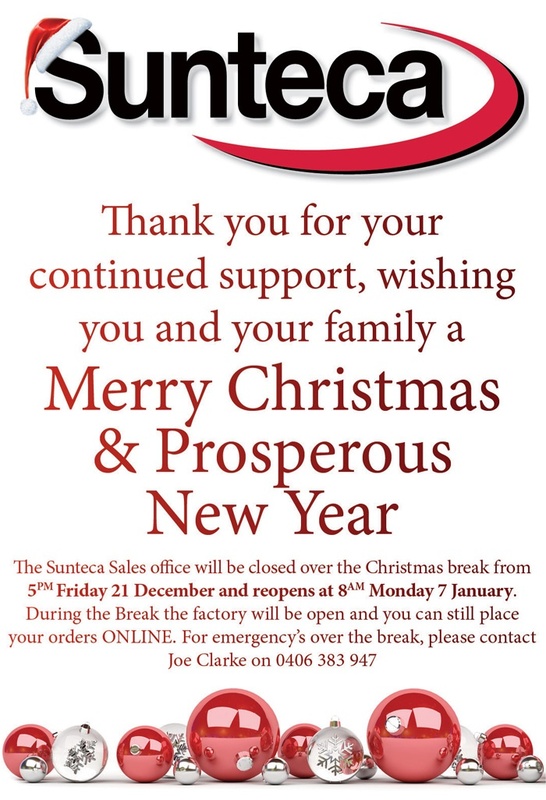 Please see link to download the latest Sunteca newsletter. 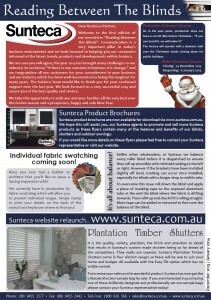 Sunteca Roller Shutters Product Brochure. 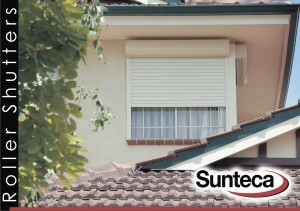 Sunteca Roller Shutters offer so many benefits they really are an excellent investment. Lightweight yet extremely strong, the curtain consists of an aluminium skin injected with a polyurethane foam for added strength and insulation qualities. To download the latest brochure for the Sunteca Roller Shutters please click on the following link: Sunteca Roller Shutters. 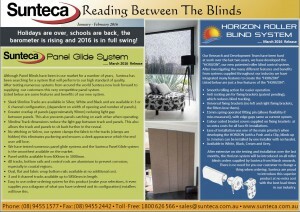 Sunteca Vertical Blinds Product Brochure. Sunteca Vertical Blinds, with so many colours and fabrics to choose from Sunteca Vertical Blinds offer a modern and sleek window covering suitable for any room in the house. They are very popular on sliding doors. Simple control options allow you to easily tilt the blades to allow light to enter but keep the direct sun out or stack the blades in the centre, each side or all to one side. Moisture resistant bottom weights and chains which have integrated step-on protection chain which easily clips on again, chainless bottom weights and sewn-in bottom weights, so many options to suit your requirements. 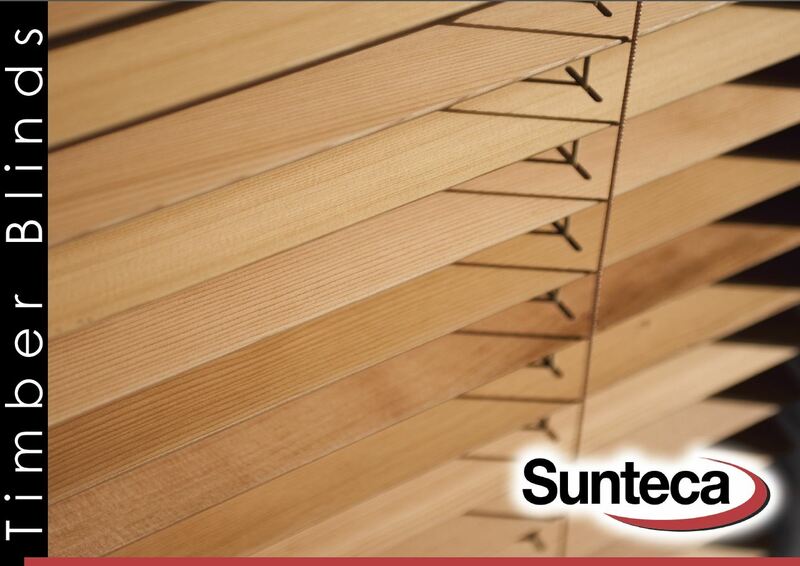 To download the latest brochure for the Sunteca Roller Shutters please click on the following link: Sunteca Vertical Blinds. 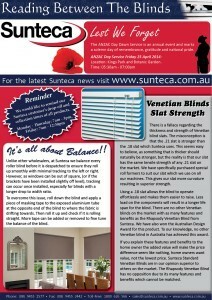 Sunteca Venetian Blinds Product Brochure. 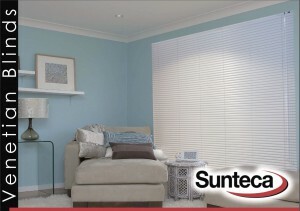 Sunteca Rhapsody Aluminium Venetians have features and benefits no other venetian has. More slats per blind than most others; Extruded aluminium top and bottom rail so no warping, buckling, rusting, unlike other venetians; light skirt on the headbox; an enclosed bottom rail so no dirt, no dead insects, no untidy cords hanging out, no bowing and designed for strength; special Looprite rollers in the headbox, thus the slats always line up so they look better; special snap-in stainless steel installation brackets with concealed fixings which make the blinds easy to install and remove, allows for easier cleaning; Epoxy enamel finish to last; advanced tilt and cord mechanisms; optional mono control, the features and benefits just keep coming. 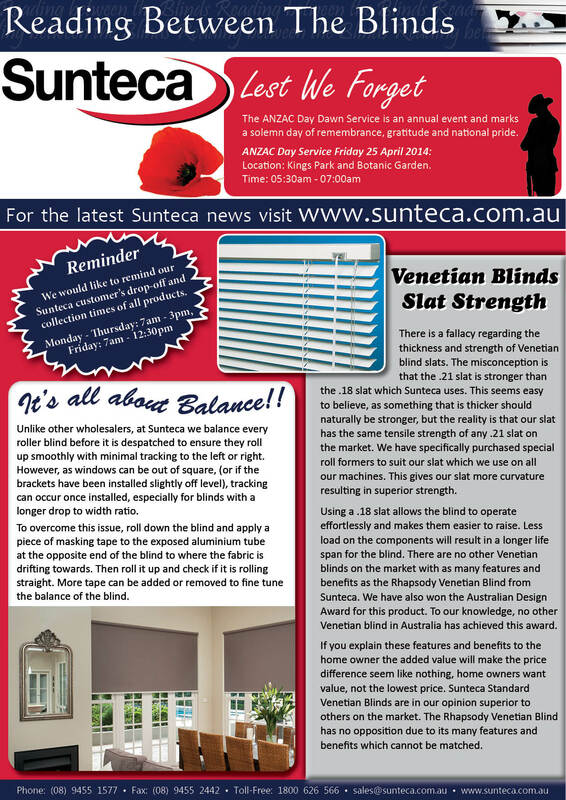 To download the latest brochure for the Sunteca Venetian Blinds please click on the following link: Sunteca Venetian Blinds. 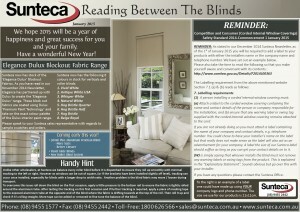 Sunteca Roman Blinds Product Brochure. Sunteca Roman Blinds, so stylish, so elegant and with so many fabrics to choose from. Fabrics include blockout, translucent, sheer and sunscreen plus we can bond your own fabric onto the Sunteca Roman system giving you a truly unique window covering. Optional decorative timber battens give a different look again. Adjustable to any position. To download the latest brochure for the Sunteca Roman Blinds please click on the following link: Sunteca Roman Blinds. 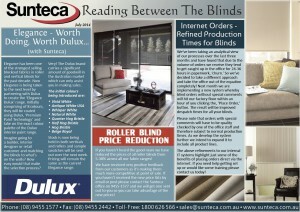 Sunteca Roller Blinds Product Brochure. 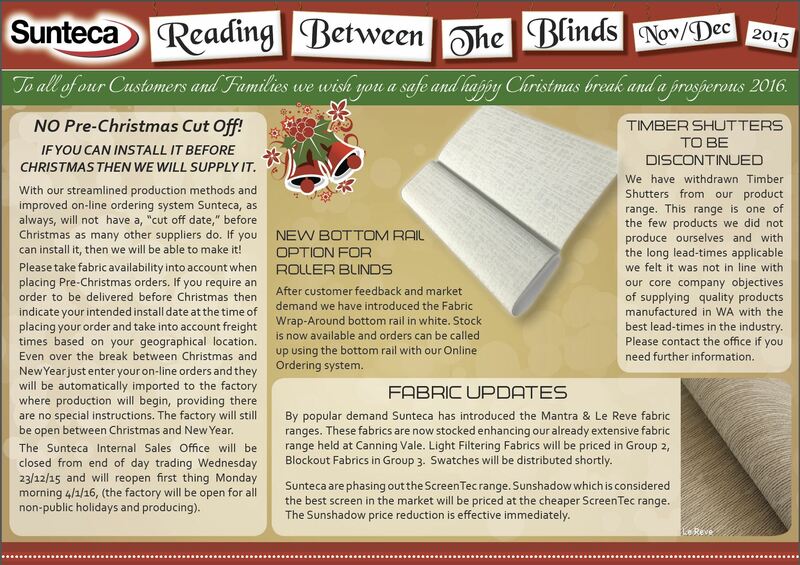 Sunteca Roller Blinds offer fabric collections that are not matched by any of its competitors. 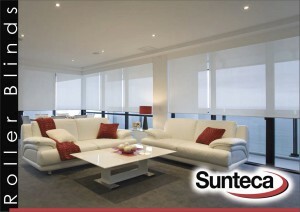 For colour, opacity, texture, trims and patterns, Sunteca Roller Blinds are simply the best. 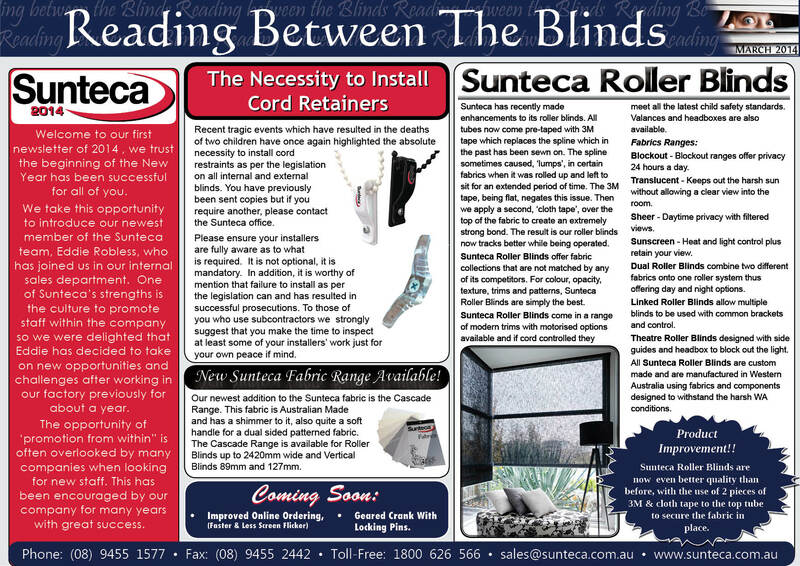 To download the latest brochure for the Sunteca Roller Blinds please click on the following link: Sunteca Roller Blinds. 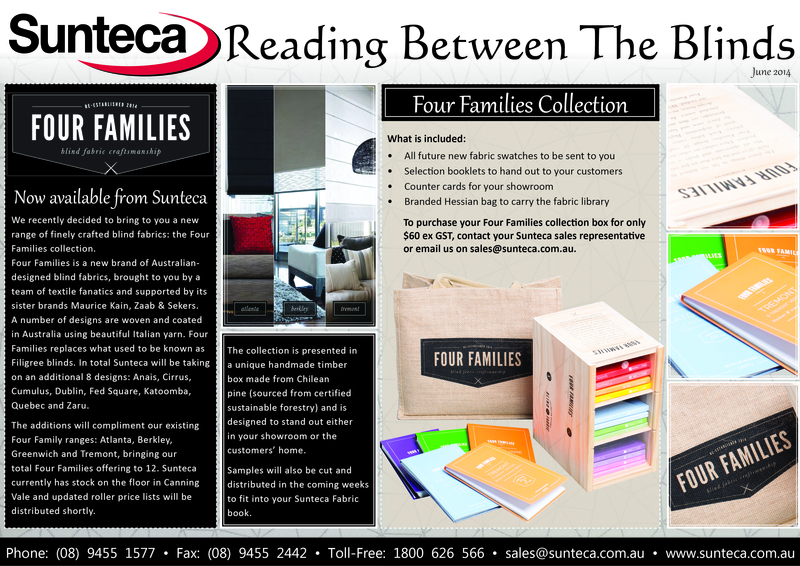 Sunteca Timber Blinds Product Brochure. With the launch of the new Sunteca website we have also designed some new product brochures which you will be able to download from our website, they will soon be heading your way with the printed brochures for distribution to your customers. 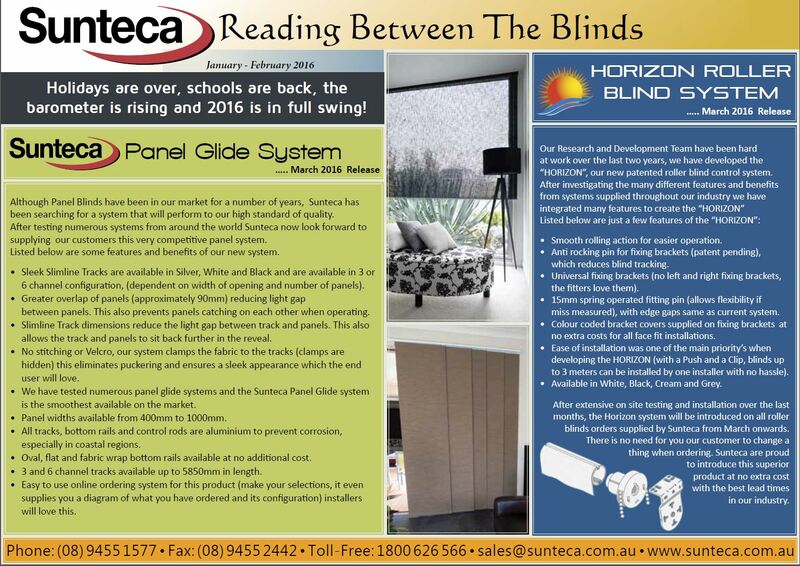 To download the latest brochure Sunteca Timber Blinds please click on the following link: Sunteca Timber Blind Product Brochure. Sunteca has revealed its brand new website as of today! We are very proud to have our new and modern look finally completed. Over the coming months we intend to use the website to improve communication and to keep you properly informed of any changes and updates. Further enhancements will be made to the ordering system to make your experience a much more pleasurable one. Watch this space! 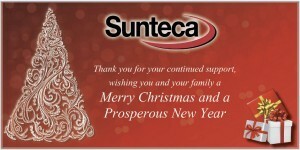 Sunteca Product Sheet Flyers will soon be coming your way. These product sheets can be attached to an email or printed out. Additionally we are in the process of getting glossy brochures printed ready for distribution. The flyers will make great selling aides and be something that will leave a lasting impression with your customers. PDF versions will be uploaded to the website over the next couple of weeks. Sunteca has revealed its brand new website as of today! We are very proud to have our new and modern look finally completed. Sunteca is going through a growing phase and showing off its new look website is a great step forward for the company and for you as customers. As Sunteca is focusing on getting the Sunteca brand name out into the market we can only reach for the stars as the sky is the limit with the new look of the Sunteca brand!